The tradition of honoring outstanding individuals every three years by inducting them into the Plastics Hall of Fame immediately before NPE® continues. This observance, which started in 1972, had a record number of nominations in 2018, and is considered the crowning achievement of any life spent in the plastics industry. “These new inductees proudly represent the length and breadth of our great industry, with a wealth of accomplishments in polymer science, engineering, manufacturing, equipment design and business management,” says Plastics Academy President Jay Gardiner. “Each individual has been elected by the living members of the Hall of Fame after a lengthy screening process.” “We look forward to honoring the past at the Hall of Fame Gala and then seeing the future of our industry at NPE2018,” says Bill Carteaux, president and CEO of Plastics Industry Association (PLASTICS), prior to the May 6 ceremony. Some of the new inductees started in the industry through family ties, others by intellectual curiosity, fate or conviction. No matter how they got into plastics, it ultimately takes both personal and professional skills to reach this level of leadership and honor. 2018 Plastics Hall of Fame Inductees: Ten plastics industry greats were inducted into the Plastics Hall of Fame Sunday evening, May 6, 2018 at NPE2018. They are; Robert Ackley, Davis-Standard; Ira Boots, Milacron Holdings Company; Karlheinz Bourdon, KraussMaffei; David Cornell, Eastman Chemical and The Association of Plastics Recyclers; Donna Davis, ExxonMobil; Steve Maguire, Maguire Products; Martin Stark, Bekum America; Hideo Tanaka, Toshiba Machine; Donald Graham, Graham Engineering; and Max McDaniel, Chevron Phillips. 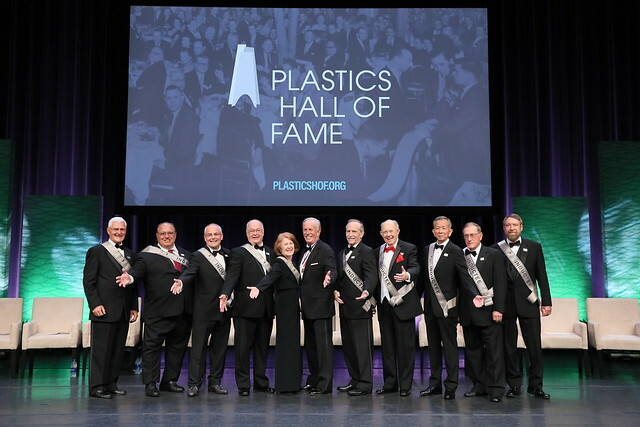 See photos honoring and celebrating the 2018 Inductees at the Plastics Hall of Fame Gala. Get a taste of the red carpet gala and awards ceremony with new this year’s, Live! From the Red Carpet at the 2018 Plastics Hall of Fame on the NPE Network.